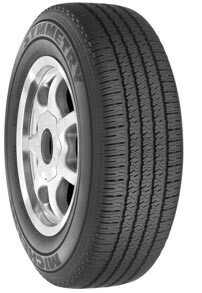 Northgate Tire is proud to offer Michelin tires, known for high durability, fuel efficiency, and reliable braking. Call or visit your Northgate Tire location to learn more about Michelin tires. In the Michelin Symmetry, value meets unsurpassed comfort. Ideal for cars and minivans, the Michelin Symmetry is developed with Michelin's Comfort Control Technology -- a computer optimized design strategy to greatly reduce vibrations and road noise. Its all-weather tread pattern includes wide center grooves for quick water evacuation and variable-width sipes for exceptional traction in any condition. The Michelin Symmetry's EnergySaver Construction delivers excellent fuel efficiency by requiring less effort from your engine. The end result is a smooth ride, keeping you and your family safe year-round, in all types of weather.